Earlier this year, Eidos Montreal announced a partnership with prosthetics specialist Open Bionics to create bionic arms inspired by the game franchise Deus Ex. The human augmentations of Deus Ex made for an obvious tie-in, but the announcement also brought to light the work Open Bionics is doing to make prosthetics more affordable. Open Bionics is using 3D printing to bring less expensive prosthetics to market, and will also be making its blueprints available royalty-free, letting people modify their own designs. 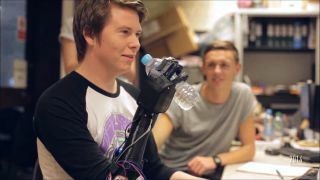 We went down to Open Bionics to talk to them about what they're doing to radically change the process of creating prosthetics, and how their partnership with Deus Ex has got them thinking about bionic limbs being used not just as medical products to replace limbs, but as additional devices to augment.